Bush left office with just 33 percent approval, and a disapproval rating, 66 percent, that tied the disgraced Richard Nixon as the highest on record for a departing president in polls since the Roosevelt administration. 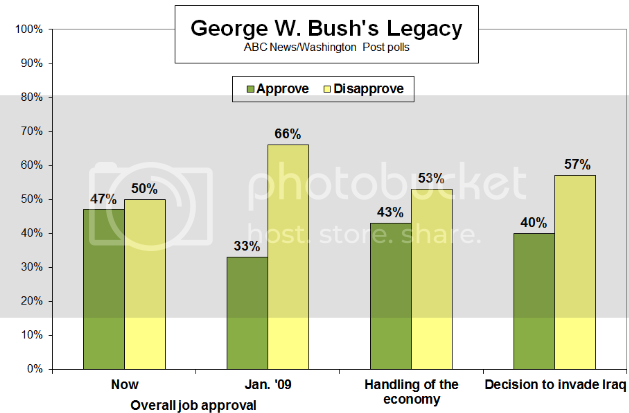 Bush’s approval rating on average across his second-term, for its part, stands alone as the lowest on record in modern polling. That collective forgetting goes double for Bush, who, more than any recent president, has stayed out of the public eye since leaving office. He is rarely quoted on any subject and largely eschews any attempts – beyond his memoir — to analyze what went right and wrong with his presidency. Plus, to the extent there is any news about Bush, it tends to be on the personal side. His father’s illness (and recovery) and his daughter’s newborn daughter are the sort of stories that paint a softer portrait of Bush and one that is far easier to like. My hunch is that future historians will remember the immense challenges George W. Bush faced during his presidency, and judge him fairly and appropriately. By the way, if I remember correctly, Bush wrote in his memoirs that keeping America safe after 9/11 was his greatest personal achievement. Thus given the horrific events of last week, I hope 43 is at least remembered by posterity as a leader who helped make large-scale, terror-from-the-skies atrocities harder to commit. And that for all his mistakes -- and controversial decisions -- in many ways he made America a safer and more secure nation.